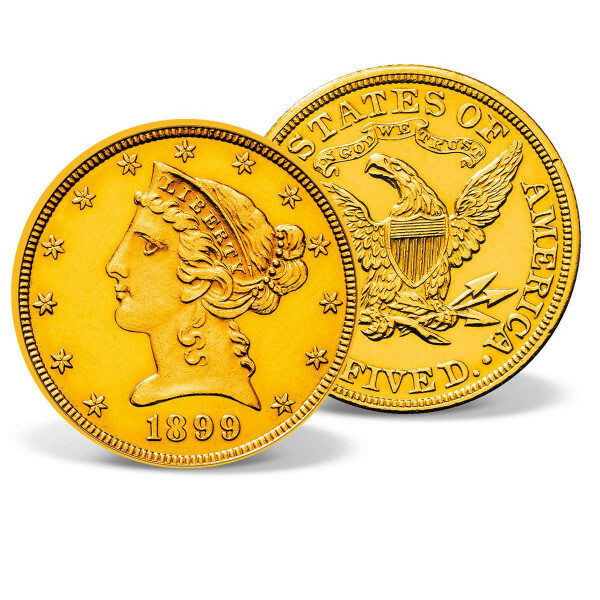 Congress authorized the U.S. Mint to coin the $5 gold piece, or Half Eagle, on April 2, 1792, the same day it authorized the creation of the Mint itself. The first gold coin minted by the U.S. government, the Gold Half Eagle had several design changes over the course of its existence. Liberty Heads were minted from 1839-1908. The Liberty Head Coronet Type with Motto -- as depicted in this 1899issue -- remains one of the most recognized and treasured variations. The Liberty Half Eagle holds the distinction of being the only coin of any type or denomination to be struck at all seven branches of the U.S. Mint. The 1899 Liberty Half Eagle depicts the famous image of Liberty on the obverse. Her coronet, or crown, bears the word "LIBERTY in bold letters. The reverse features the Great Seal of the United States. These historic coins contain .24187 troy ounces of pure gold.